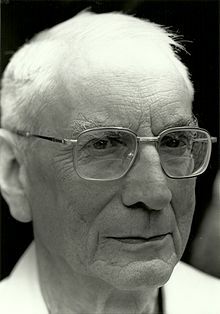 Pierre Hadot (/ɑːˈdoʊ/; French: [ado]; 21 February 1922 – 24 April 2010) was a French philosopher and historian of philosophy specializing in ancient philosophy, particularly Neoplatonism. In 1944, Hadot was ordained, but following Pope Pius XII’s encyclical Humani generis (1950) left the priesthood. He studied at the Sorbonne between 1946–1947. In 1961, he graduated from the École Pratique des Hautes Études, where he would become the Director of Studies from 1964 to 1986. He was eventually named professor at the Collège de France in 1982, where he held the Chair of History in Hellenistic and Roman Thought (chaire d'histoire de la pensée hellénistique et romaine). In 1991, he retired from this position to become professeur honoraire at the collège; his last lecture was on 22 May that year. He concluded the class saying, "In the last analysis, we can scarcely talk about what is most important." Hadot was married to the historian of philosophy, Ilsetraut Hadot. Hadot was one of the first authors to introduce Ludwig Wittgenstein's thought into France. Hadot suggested that one cannot separate the form of Wittgenstein's Philosophical Investigations from their content. Wittgenstein had claimed that philosophy was an illness of language and Hadot notes that the cure required a particular type of literary genre. Hadot is also famous for his analysis on the conception of philosophy during Greco-Roman antiquity. Hadot identified and analyzed the "spiritual exercises" used in ancient philosophy (influencing the thought of Michel Foucault in the second and third volumes of his History of Sexuality). By "spiritual exercises" Hadot means "practices ... intended to effect a modification and a transformation in the subjects who practice them. The philosophy teacher's discourse could be presented in such a way that the disciple, as auditor, reader, or interlocutor, could make spiritual progress and transform himself within." Hadot shows that the key to understanding the original philosophical impulse is to be found in Socrates. What characterizes Socratic therapy above all is the importance given to living contact between human beings. Hadot's recurring theme is that philosophy in Antiquity was characterized by a series of spiritual exercises intended to transform the perception, and therefore the being, of those who practice it; that philosophy is best pursued in real conversation and not through written texts and lectures; and that philosophy, as it is taught in universities today, is for the most part a distortion of its original, therapeutic impulse. He brings these concerns together in What Is Ancient Philosophy?, which has been critically reviewed. (Only translations into English are included in this list). with P. Henry, Marius Victorinus, Traités théologiques sur la Trinité, Cerf 1960 (Sources Chrétiennes nos. 68 & 69). Porphyre et Victorinus. Paris, Institut d'Etudes augustiniennes, 1968. (Collection des études augustiniennes. Série antiquité ; 32–33). Exercices spirituels et philosophie antique. Paris, Etudes augustiniennes, 1981. (Collection des études augustiniennes. Série antiquité ; 88). ISBN 2-85121-039-4. Philosophy as a Way of Life. Spiritual Exercises from Socrates to Foucault, edited with an Introduction by Arnold I. Davidson, translated by Michael Chase, Oxford/Cambridge, Massachusetts, Basil Blackwell, 1995, Oxford, Blackwell's, 1995. ISBN 0-631-18032-X. La citadelle intérieure. Introduction aux Pensées de Marc Aurèle. Paris, Fayard, 1992. ISBN 2-213-02984-9. Qu'est-ce que la philosophie antique? Paris, Gallimard, 1995. (Folio essais ; 280). ISBN 2-07-032760-4. Plotin ou la simplicité du regard ; 4e éd. Paris, Gallimard, 1997. (Folio esais ; 302). ISBN 2-07-032965-8. Etudes de philosophie ancienne. Paris, Les Belles Lettres, 1998. (L'âne d'or ; 8). ISBN 2-251-42007-X (recueil d'articles). Marc Aurèle. Ecrits pour lui même, texte établi et traduit par Pierre Hadot, avec la collaboration de Concetta Luna. vol. 1 (general introduction and Book 1). Paris, Collection Budé, 1998. ISBN 2-251-00472-6. Plotin, Porphyre: Études néoplatoniciennes. Paris, Les Belles Lettres, 1999. (L'âne d'or ; 10). ISBN 2-251-42010-X (recueil d'articles). La philosophie comme manière de vivre. Paris, Albin Michel, 2002. (Itinéraires du savoir). ISBN 2-226-12261-3. Exercices spirituels et philosophie antique, nouvelle éd. Paris, Albin Michel, 2002. (Bibliothèque de l'évolution de l'humanité). ISBN 2-226-13485-9. Le voile d'Isis: Essai sur l'histoire de l'idée de nature. Paris, Gallimard, 2004. (NRF essais). ISBN 2-07-073088-3. Wittgenstein et les limites du langage. Paris, J. Vrin, 2004. (Bibliothèque d'histoire de la philosophie). ISBN 2-7116-1704-1. Apprendre à philosopher dans l'antiquité. L'enseignement du Manuel d'Epictète et son commentaire néoplatonicien (with Ilsetraut Hadot). Paris, LGF, 2004. (Le livre de poche ; 603). ISBN 2-253-10935-5. ^ John M. Cooper, Pursuits of Wisdom: Six Ways of Life in Ancient Philosophy from Socrates to Plotinus, Princeton University Press, 2012, p. 18. ^ a b c Pierre Hadot, Philosophy as a Way of Life, trans. Michael Chase. Blackwell Publishing, 1995. Postscript: An Interview with Pierre Hadot, p. 278. ^ a b Pierre Hadot, Philosophy as a Way of Life, trans. Michael Chase. Blackwell Publishing, 1995. Postscript: An Interview with Pierre Hadot, p. 277. ^ Pierre Hadot, Philosophy as a Way of Life, trans. Michael Chase. Blackwell Publishing, 1995. Postscript: An Interview with Pierre Hadot, p. 284. ^ Hadot, P. (1995), Philosophy as a Way of Life, Oxford, Blackwell. ^ a b Hadot, Pierre (2002). What Is Ancient Philosophy?. Harvard University Press. p. 6. ISBN 0-674-00733-6. ^ Zeyl, Donald (June 9, 2003). "What is Ancient Philosophy?". Notre Dame Philosophical Reviews. Retrieved 2015-09-24. M. Chase, S.R.L. Clark, M. McGhee, eds., (2013). Philosophy as a way of life: ancients and moderns. Essays in honor of Pierre Hadot Wiley-Blackwell. ISBN 978-1-4051-6161-9. This page was last edited on 8 March 2019, at 10:45 (UTC).